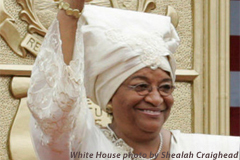 Ellen Johnson Sirleaf is the first woman elected President in an African Country! She replaces a brutal war-lord and offers new hope to Liberia and to the African continent. I believe that women will be the change that brings about a more peaceful world, and I am encouraged that even though the United States is lagging behind, other countries are moving forward in a progressive way. This is Wonderful News!